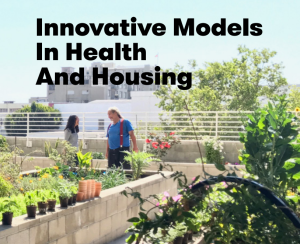 The report, prepared for the Kresge Foundation and the California Endowment, profiles nine case studies from across the country in which healthcare and affordable housing sectors partnered to bring better housing and better health to their communities’ most vulnerable populations. The case studies show that, despite the many barriers to collaboration facing the healthcare and housing sectors, these partnerships can reduce government expenditure while improving the health of society’s most vulnerable. “As these nine communities show us, providing housing as an alternative to unnecessary use of hospital and institutional-based care is good medicine and can be a place where we can find common ground across the political spectrum,” said one of the paper’s co-authors, Joshua Bamberger, MD, Mercy Housing’s Chief Medical Consultant and a primary care physician who has worked with San Francisco’s homeless population for more than 25 years. In Hennepin County, Minnesota, for example, the state has given people who are homeless and disabled a state-funded monthly income supplement called Group Residential Housing (GRH), which has helped people experiencing homelessness find rental homes. With considerable state investment in supportive housing, as well as with the help of a local Accountable Care Organization (ACO), which helps participants find housing, Hennepin County is scheduled to reduce the number of chronically homeless adults to “functional zero” by the end of the year. In Salinas, California, Central California Alliance for Health (CCAH), a medium-sized managed care organization, gave MidPen Housing Corporation, a nonprofit housing developer, a capital grant to develop affordable housing in the area. By providing these members with quality housing, the partnership hopes to improve their quality of life while also lowering their healthcare costs. These and the seven other case studies show that the healthcare sector can and should invest in affordable housing. The report also demonstrates that, even in these divisive times, well thought-out partnerships have the ability to improve health and transform lives.